Unifor rail workers were in Ottawa in recent weeks to urge Canadian Senators to amend the government bill authorizing workplace surveillance (Bill C-49). Bill C-49, An Act to amend the Canada Transportation Act and other Acts respecting transportation and to make related and consequential amendments to other Acts, proceeded rapidly through the House of Commons and is proceeding to second reading in the Senate this month. 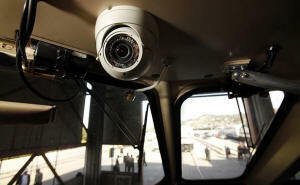 The bill proposes to require all railway operators to install and utilize Locomotive Voice and Video Recorders (LVVRs). Unifor says the government has provided little evidence to demonstrate how LVVRs will be an improvement over the “black box” data recorders already installed on trains. Unifor submitted a formal response in August and hopes to have the LVVR measures scrapped altogether or be overseen by strict regulation that prevent employers from accessing footage for punitive purposes.